This is an edited excerpt from my previously published article, “Racism, Revelation and Recipes: Towards Christian Inter-Cultural Communities” (Christian Educator’s Journal, April 2008). It lays out a biblical-theological perspective on ethnic diversity and racism. I regard this as still a work-in-progress. 1. Diversity, in and of itself, is a God-created good that reflects the unity (oneness) and diversity (three-ness) of the Triune God. Christian theologians have argued that the doctrine of the Trinity – God as one in being and three in person – can serve as a model for human society and community. God’s oneness calls us to unity while his three-ness affirms our diversity and uniqueness. God’s handiwork, his creation, also reflects this unity in diversity. The incredibly rich diversity of uniquely individual creatures – of plants, animals, rocks and trees – are all created, united and held together in Christ (Colossians 1:15-17). Even humanity was created with the diversity of male and female. It must be stressed, then, that creational diversity is never a diversity of division – it is not differences that divide – but rather a diversity of unity – differences that are united in relationship to each other in love and obedience to God the creator. Thus, difference and diversity, in and of itself, is a created gift from God that reflects part of God’s own nature. And the unity that Christ brings through his redemptive work is not a new unity but restoring and renewing a unity that was already there at the beginning of creation, a unity that was disrupted by sin. 2. Ethnic, cultural and linguistic diversity, in and of themselves, is not evil or sinful but fulfills a purpose in God’s plan for humanity. Among all of creation’s diversity, human cultural diversity – ethnic and linguistic differences – is also part of God’s good creation. Sometimes, Christians view cultural diversity as part of the fallen world, as a curse. The biblical narrative of the Tower of Babel (Genesis 11:1-9) is often used to justify such a negative view. A closer reading, however, suggests that God’s confusion of “tongues” or languages at Babel was not a curse but more a tool of God’s grace. The central sin of Babel is not simply pride in trying to unify the world, even though that is implicated. Rather, the Babel builders’ sin is trying to define their corporate identity apart from God. To “make a name” (v. 4) for oneself means more than just becoming famous. Names in the Old Testament, and in the Bible in general, are supposed to capture the object’s essence or character; you are what your name is, so to speak. So, making a name here also means they are trying to define who they are apart from God. This ‘self-naming project’ is linked to both their unification project and their building project – “Come, let us build ourselves a city, with a tower that reaches to the heavens, so that we may make a name for ourselves and not be scattered over the face of the whole earth” (v. 4 NIV). There’s evidence to suggest that this story was composed with a glance towards the Babylonian empire. The land of Shinar (v. 2) is connected to Babylon. 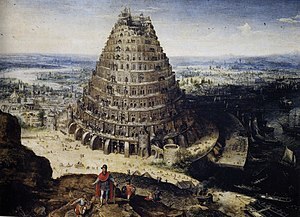 And the word “babel” in the Babylonian language means “gate of god”. Thus, the name or identity that the Babel builders seek for themselves is to be “the gate of god,” a heaven on earth. They desired to make their own perfect society, by means of technology (verse 3) and architecture (verse 4) and by implication through political and religious means, similar to Babylon’s empire building (an allusion that would not be lost on ancient Israelites) symbolized by Babylon’s ziggurat towers that purports to be gateways to the gods. But “babel” in Hebrew is “confusion” or even, “folly”. So, Genesis mocks the Babylonians: they think they are building heaven on earth, but in reality, they are confused and foolish. Therefore, God’s confusion of them is a means to prevent them from such foolish idolatrous identity making projects that reject God’s naming and identity giving. God’s intervention and creation of diverse languages actually forced them to fulfill God’s original command in Gen. 1:28 to “fill the earth and subdue it,” something which these Babel builders were afraid to do – they were afraid of being “scattered abroad upon the face of the whole earth,” a phrase repeated three times (verses 4, 8 and 9). Human cultural and linguistic diversity, then, fulfills a redemptive purpose in God’s plan, and is not a curse. 3. Diversity is distorted by the fall into sin, turning into a systemic ideological idolatry that breaks down community. Racism, therefore, is a sin. But why, then, is human cultural and ethnic diversity often a source of division and even violence to each other? Human sin and rebellion has distorted the good creational diversity that God created. Fallen human cultural diversity is often misdirected toward serving an idol that takes God’s place in the center of that culture. Such idolatries are always embodied in ideologies or worldviews that become systemic in a culture or community. Because of the fall into sin, humanity tend to put asunder what God has joined together – God’s diversified unity is constantly being torn apart by fallen humans into either division, fragmentation or disintegration (individualism, pluralism, relativism) or uniformity, fusion or homogeneity (collectivism, fascism, absolutism). Racism partakes of this brokenness in the polarization of uniformity (only those like us) and division (those not like us). This, therefore, breaks down human community. Race is an artificial pseudo-scientific category used to describe people who share biologically transmitted traits that are defined as socially significant. Although it is commonly believed to be a scientific ‘fact’, there is actually no scientific evidence to support the categorization of humanity into biological ‘races’ based on physical traits such as skin color, eye color and nose width. But what is even more important is that these rather insignificant physical traits are given social significance by ideology. The physical ‘racial’ traits only have social significance because we give them significance – they are artificial. We have been accustomed to think that these physical differences amount to some moral and social difference – such as intelligence, goodness, beauty, honesty, etc. Such thinking is rooted in a distorted ideology, not in creation. Because this idolatrous ideology is systemic in our culture, it has affected all of us. In systemic racism, a racist ideology is embodied in the policies, practices, norms and symbols of social institutions, organizations, communities and cultures. A racist ideology embodied in the educational, political, legal, economic, cultural and religious institutions shapes a whole community of people. Racism is not explicitly taught; rather we are caught in its web. There are systemic racist images via popular movies, TV and advertising that capture our imaginations. There are systemic racist practices that shape our behaviors, e.g. hiring practices. There are still ideological arguments that perpetuate racism albeit in different new incarnations, e.g. anti-immigration laws. The point here is that racism is not simply an individual behavior and attitude problem. It is bigger, wider and deeper than that: it is a systemic sin. 4. God’s mission of reconciliation inseparably includes reconciliation of people to each other, including racial reconciliation. Distorted diversity is being restored in Christ Jesus. Even in the Old Testament already, God’s redemption plan includes blessing “all the nations” through Abraham (Gen. 18:18, 26:4), and making his house “a house of prayer for all nations” (Isa. 56:7). Ethnic identity is always subordinate to spiritual identity. God’s heart for racial reconciliation is also seen in the outpouring of the Holy Spirit at Pentecost (Acts 2:1-12). At Pentecost, God equipped a mono-cultural group of disciples to do cross-cultural outreach in order to establish a multi-cultural church. Jewish pilgrims who came from all over the Roman Empire to Jerusalem for Pentecost know either Aramaic (the language of the Synagogues) or Greek (the commercial language of the Roman empire) or both. There is, therefore, no logistical need for the “tongues” – the speaking of different languages. But there is great symbolic need due to the fact that the regional native tongues were never used in the religious services of their local synagogues. God uses those different native tongues – hitherto never been used in religious worship – to affirm and bless these languages and cultures as vehicles of His revelation and praise. Thus, the first Christian outreach event after Jesus’ ascension was an inter-cultural, cross-cultural outreach. Or, if you wish, the first post-resurrection Christian mega-worship service was a multi-lingual one! One can even argue from this that God’s default church is an inter-cultural church, NOT a mono-cultural one. 5. The church, or the Christian community, is God’s strategic vehicle for embodying, proclaiming and promoting God’s reconciliation of all things, including racial reconciliation. Being united in Christ through faith does not mean that ethnic and cultural differences will be erased. Rather, ethnic and other categories (economic, gender, etc.) are no longer definitive of our identities. Galatians 3:28 — “There is neither Jew nor Greek, slave nor free, male nor female, for you are all one in Christ Jesus” (NIV) — is not a call to erase ethnic, class and gender diversity in an ontological or absolute sense. 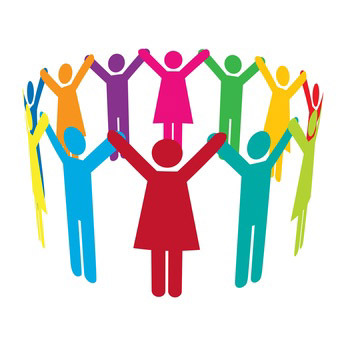 Rather, it is a call to break down any existing barriers and inequalities between them. Bible scholars have shown that Galatians is not primarily about soteriology – how are we saved? – but about ecclesiology – how are we to be church? (See Gordon D. Fee, “Male and Female in the New Creation” in Discovering Biblical Equality, IVP 2002, pp. 172-185) The issue of salvation by faith, not by works, helps equate all the different people groups, and makes them one new community in Christ Jesus. And this new Christian community, the Church, is not a place for any kind of social barriers. Particularly because the church – and Christian communities, including Christian schools – are God’s primary vehicle for his reconciliation mission, which as we have seen, includes reconciling people to each other. We need to embody this one-ness in Christ Jesus. 6. Reconciliation of all things will only be fulfilled at Christ’s second coming with the new heaven and new earth. Christians, individually and corporately, work towards that reality as God’s agents of transformation, with hope and humility. Only God can bring about the full restoration and reconciliation of diversity in unity. This keeps us Christians humble as we go about being faithful and obedient in being agents of reconciliation for God, knowing that our efforts will not bring heaven on earth. But God also promises that full restoration will happen. This frees us and encourages us to be bold, creative and even take risks, knowing that the new creation does not depend on our successes/failures. We are called to be faithful agents, not agents who sit on our hands. William Wilberforce, the 18th – 19th century politician and social reformer who abolished the slave trade in the British Empire, once wrote, “Let [a Christian] remember that his chief business while on earth is not to meditate, but to act” (from his A Practical View of the Prevailing Religious System of Professed Christians, 1797; reprint SCM Press 1958, p. 103). What would you add to this biblical reflection on ethnic diversity? Or do you disagree? This entry was posted in Cultural Diversity, Racism, Theology and tagged Bible, Diversity, Ethnicity, Institutional racism, Inter-Cultural, Multiculturalism, Pentecost, Racism, Tower of Babel. Bookmark the permalink.